WASHINGTON (AP) — Squinting while texting? Always losing your reading glasses? An eye implant that takes about 10 minutes to put in place is the newest in a list of surgical repairs for the blurry close-up vision that is a bane of middle age. But who’s really a good candidate to toss their specs? Nearly everybody will experience presbyopia at some point, usually starting in the mid-40s. At first you may notice yourself holding restaurant menus at arm’s length. Eventually, even in good light, reading becomes a blur. How well you see has to do with how light is directed through the natural lens to the back of the eye. That lens stiffens with age, losing its ability to shift and bend light so that it becomes more difficult to focus close-up. The usual options are magnifying drugstore reading glasses or, for people with other vision problems, bifocals, multifocal contact lenses or what’s called monovision, correcting for distance vision in one eye and near vision in the other. And while surgery always carries some risk, corneal inlays that are implanted into the eye’s clear front surface are getting attention because they’re removable if necessary. “It’s not magic. It’s surgery. People have to remember this is not one and done,” but requires post-surgical exams and care, said Dr. Deepinder K. Dhaliwal of the University of Pittsburgh Medical Center, a corneal specialist who is watching studies of the inlays. Krupinsky was a little nervous while lying on the operating table to receive the new Raindrop near vision inlay. 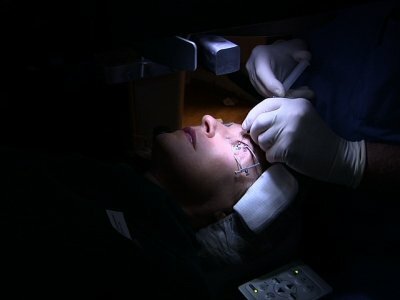 “The most you’re going to feel is pressure,” promised Washington refractive surgeon Dr. Mark Whitten, applying numbing drops to her left eye. A gel-like device that looks like a miniature contact lens, the Raindrop is smaller than the eye of a needle. It’s the first implant to treat presbyopia by changing the cornea’s shape, making it steeper to alter how light passes through. It’s placed in only one eye; both eyes still see at a distance. Patients can test-wear a single contact lens to be sure they’ll like the effect before choosing surgery. Rose, the ophthalmologist, checked for dry eye, underlying diseases like glaucoma, and whether the corneas were thick and healthy enough to implant before turning Krupinsky over to her surgical partner. “Just look straight up,” Whitten said as he used a laser to slice a flap in Krupinsky’s cornea. He centered the Raindrop inlay over her pupil and lowered the flap to seal it in place. Minutes later, Krupinsky read lines on an eye chart she previously couldn’t make out without glasses, albeit still a little blurry. She’ll need eye drops for several months as her cornea heals so vision can sharpen. Maker ReVision Optics Inc. is gradually training eye surgeons to use the Raindrop properly, after the Food and Drug Administration approved it last summer based on a study of 373 people whose only vision problem was moderate presbyopia. Two years later, 92 percent had good near vision, 20/40 or better without glasses, in the implanted eye. Potential side effects include infection, dry eye, glare, or corneal problems such as scarring. About 7 percent of study participants had the implant removed, mostly because they weren’t satisfied with their vision or experienced a haze or clouding of the cornea. Most returned to their pre-surgical vision, although one had lingering haze. —Another FDA-approved corneal inlay, the Kamra, is a doughnut-shaped device, also used in one eye and removable. It works like a pinhole camera, improving vision by focusing light through the center of the pupil. —A more invasive operation replaces the natural lens in each eye with an artificial one, named Symfony, that can focus both near and far. Approved for cataract surgery, it also is being offered as a presbyopia fix for the middle-aged who don’t yet have cataracts. Unlike inlays, artificial lenses can’t simply be removed. Insurance doesn’t cover elective presbyopia surgery. Rose said the inlays average about $4,000 to $5,000, while the artificial lens in both eyes can cost twice as much. Patients should consult a surgeon experienced with all the options who can determine which best suits their eyes, advised Pittsburgh’s Dhaliwal. Each has pros, cons and unknowns. For example, elective lens replacement isn’t for the very nearsighted because they’re at higher risk for a vision-threatening complication, Dhaliwal said. And the Raindrop hasn’t been studied in people who years ago underwent LASIK surgery to correct nearsightedness. That didn’t deter Mike Gray, 52, of Haymarket, Virginia, who lost his reading glasses so often that he bought bulk packs. To implant the inlay, Whitten had to avoid cutting the cornea in the same place as Gray’s long-ago LASIK, and advises such patients to pick a surgeon experienced in both procedures. “Everything is very clear and getting better every day,” Gray said about a month later.